Per a great recommendation from Pam, Marcus and I met up with one of his old high school friends, Zubin, at Hog Island Oyster Bar over at the Ferry Building for its amazing Happy Hour! With its own farm, stands at many Farmers' Markets in the Bay Area, as well as the two oyster bars (one at the Ferry Building, another in Napa), Hog Island Oyster Co. has always made its mission been "to grow great oysters, create a fresh and fun oyster experience, and have a great time doing it." 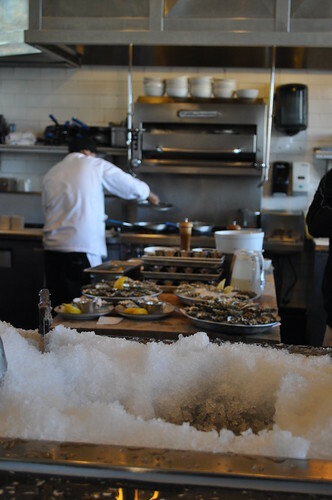 It is crazy to think how the founders of Hog Island Oyster--John Finger, Terry Sawyer and Michael Watchorn--began their celebrated enterprise. All graduates with a degree in Marine Biology from different universities on opposite coastlines, the three guys met and became friends in Santa Cruz, California. In the late 70s, Mr. Finger moved to California for a short-term job at an oyster company, where he met Mr. Watchorn. Soon, Mr. Finger found himself running the farm on his own, but it didn't come easy at first. In fact, their first experiences in oyster aquaculture were rough, but they learned so much from the process. They soon realized, "if done properly, growing high quality oysters for the half shell market could be a good business and a great lifestyle." After being introduced to Tomales Bay in Northern California, Mr. Finger saw the perfect location for a future oyster farm. From there, Mr. Finger and Mr. Watchorn launched the Hog Island Oyster Co. in 1983 with a $500 loan from their parents and a five-acre lease on northern Tomales Bay. At the very start of their venture, they adopted the French "rack and bag" method for cultivating oysters, whereby oysters are grown in mesh cages or bags, staked about one to two feet off the bottom. By using this method, oysters are protected from predators and do not become cramped for space as they grow in size. Additionally, the oysters do not have to filter as much and and mud in order to get nutrients, resulting in faster growth and a deeper cup than beach cultured oysters. However, if an oyster is raised entirely using this method, then it is pampered, yielding brittle shells, thus making it difficult to shuck without breaking. Although the "rack and bag" method is more tedious and costly, "it produces exquisitely shaped oysters, perfect for 'slurping off the half shell.'" 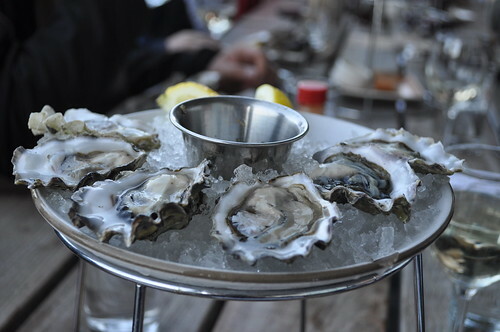 The first bushels of Hog Island oysters were delivered to the famed restaurants of Zuni Café, Pacific Heights Bar and Grill and Chez Panisse. At the same time, their friend, Terry Sawyer, an aquarist with the Monterey Bay Aquarium, was making weekend trips to Tomales Bay to help plant salvaged oyster seed on Hog Island’s five acres. He also spent the weekends helping to haul freshly harvested oysters to market and shucking his way around the Bay Area as part of "their crowd pleasing, innovative Hog Island Traveling Oyster Bars," all the while maintaining his job with the aquarium in Monterey. By 1988, Hog Island grew enough for Mr. Sawyer partnership to the Company, a career move that had him leave his job at the aquarium to help build an admirable and great business in harvesting and shucking delicious oysters! 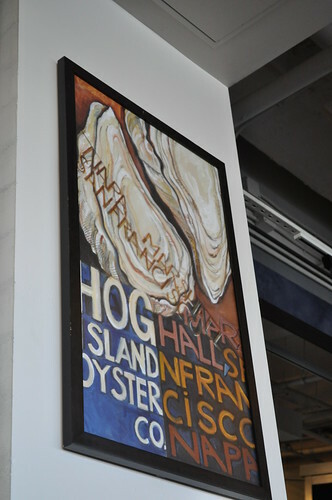 Ever since, co-founders Mr. Finger and Mr. Sawyer remain involved in all areas of Hog Island's business operations. They "stayed the course and built their vision of offering an exceptionally fresh, fun and unique oyster experience to the community." Today, Hog Island Oyster Farm leases 160 acres in Tomales Bay (a long way from the Company's initial five) where they raise over 3 million Pacific, Kumamoto, and Atlantic oysters per year as well as Manila clams and mussels. 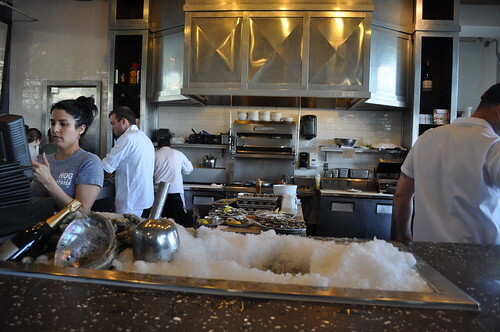 Inside Hog Island Oyster Bar at the Ferry Building! We had arrived a little before 5 PM, encountering a relatively long line. We weren't meeting Zubin until 5:45 PM, giving us ample time to wait in line for a highly demanded table at the oyster bar. View of the kitchen bar area! Close up of the freshly harvest oysters! Oysters being plated for hungry patrons! When Zubin arrived, it was perfect timing because we had just gotten a table outside looking onto the San Francisco Bay (more specifically, the East Bay) toward the Bay Bridge. 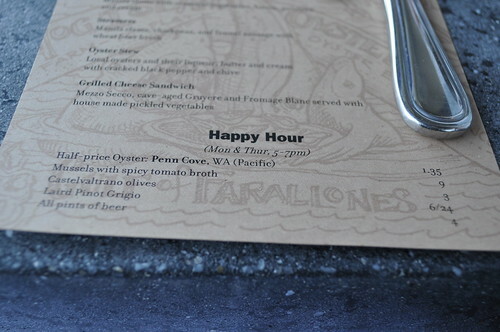 The part of the menu we had been waiting for all day--the Happy Hour menu that offers specials on chef's choice oysters (selection varies weekly at half-price! 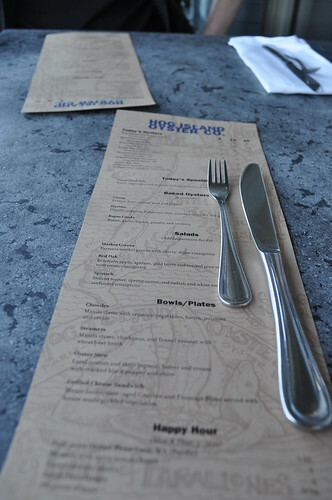 ), mussels, olives, Pinot Grigio, and all pints of beer! When Pam had asked me if I liked raw oysters, I have to admit that I answered with a little grimace. I remembered when Lisa and I went to our favorite restaurant at the time, fresh., located in Tribeca (now closed), she was so excited about the wide selection of in season oysters at the restaurant's raw bar at the time that she got me to be adventurous and accompany her tasting frenzy. Let us just say that it wasn't really pleasant for me--the slimy and watery texture just gets to me. I can eat most raw things (throw an omakase at me any day, and I'll usually be fantastic and enjoy it), but I just have a thing with oysters--I just prefer them cooked. So when we arrived to Hog Island, I had my reservations, but since we were all the way in San Francisco (for on a literal "foodie holiday"), I vowed to be brave. Even after looking at the menu, Marcus and Zubin had their doubts, too. I trust Pam's taste in food very much, so I ordered a six Happy Hour oysters--on the Monday we went, they were from Penn Cove, Washington. These oysters came with a lemon wedge and Hog Island's original take on hogwash (i.e., the dipping sauce found in the middle), and no, this hogwash was not nonsense--it was anything but! Hogwash is typically a mixture of seasoned rice vinegar, natural rice vinegar, a finely diced shallot, finely chopped cilantro, and lime juice, but at Hog Island, they add a large Jalapeño pepper, seeded and finely chopped, into the concoction. I took my first half-shelled oyster, scooped it out of the shell, plunged nice and well in the hogwash, took a big look at it (followed by a large gulp), and slurped the little sucker. To my shocking surprise, it was refreshingly delicious. There was no awkward texture--no slime, no strange wateriness. Just an overwhelming freshness of the oyster and amazing, zesty flavor from the hogwash with a hint of lemon. No fishiness whatsoever. I'm totally converted. I can testify to this conversion (as can Marcus and Zubin) as we ordered another plate of TWELVE oysters followed by another plate of EIGHT! I'm telling you, the hogwash had us at first slurp! The oysters just slid into a euphoric and exquisite state on your tongue, hogwash snapping as they tingle down your throat. Trust me, your taste buds will be tingled helpless into a delicious delirium. 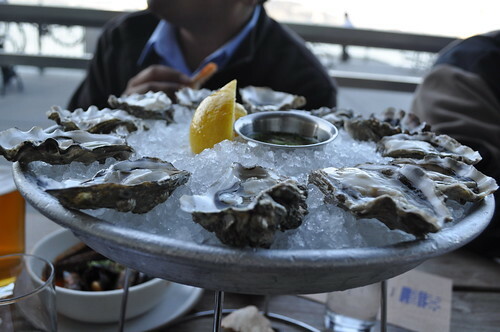 It was extremely sad when we landed back in New York City a couple days later--the first thing I craved were a plate of fresh, raw oysters from Hog Island! I also ordered a glass of the Laird Pinot Grigio from the Happy Hour menu. It's not my typical go-to white wine, but what the heck, I thought to myself, might as well! The Pinot Grigio paired really well with the hogwashed oysters! 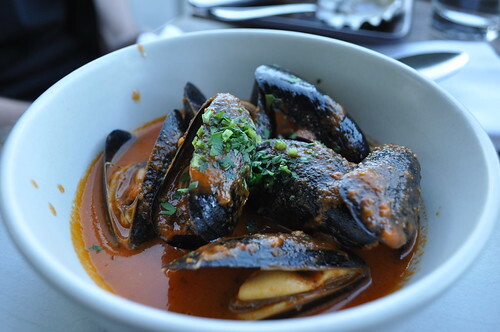 Along with the oysters, we got two bowls of mussels with spicy tomato broth and fresh herbs. The mussels were very fresh, pretty big, and juicy. I could have totally brought the sauce home with me to pour atop linguine or spaghetti! Instead, we dipped pieces of bread into the sauce, which was just as great--just another way to have more of that wonderful broth! It had some really bold spices to it--a nice rounded tomato broth! What I liked most about it was that it was light--the ideal kind of juice/broth for mussels to wade in. 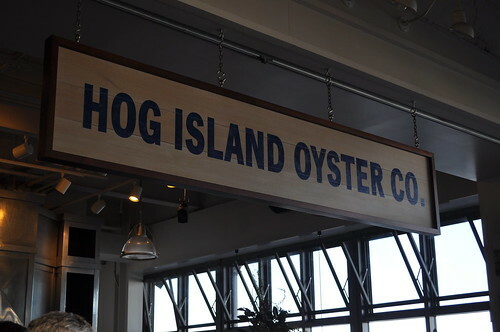 Findings: I highly, highly recommend stopping at Hog Island Oyster Co. for its selection of amazing raw oysters--even better if you could make it to one of its Happy Hours during the week! Really, really awesome deal--who can say no to half-priced oysters, especially when they are raised and harvested using the French "rack and bag" method, which yields beautifully shaped vessels, and in turn, delicious oysters. These oysters totally changed my feelings about oysters from a reasonable disgust to a fond appreciation (and maybe even a crazed obsession when I'm craving them like mad). I wish there was a better way I could describe the taste and sensation better--I feel like I'm not doing these oysters justice, but hey, it's my best effort! 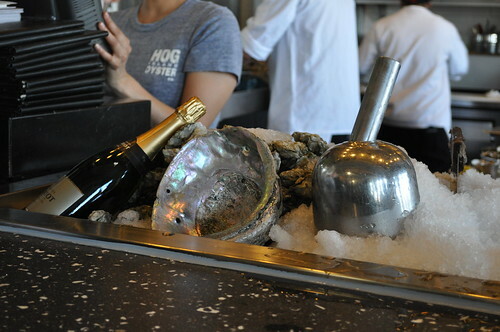 I hope to return to a Hog Island Oyster Bar (whether at the Ferry Building or in Napa) very soon. During that visit, I'm definitely trying its other oysters as well as this legendary grilled cheese that Yelp boasts "is to die for," which in that case, must be worth trying! Thanks again to Pam for the fantastic recommendation! 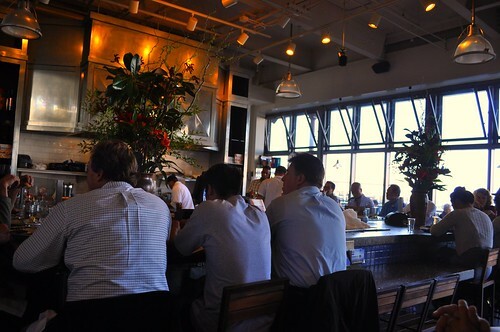 Looking forward to another visit to Hog Island Oyster--whenever that may be! Price point: half-price oysters at $1.35 each, $9 for each order of mussels, $6 for a glass of Pinot Grigio--all during Happy Hour!